Sharing Best Practices and Lessons Learned for Supporting Women’s Land Rights: A Debate on the Gender Evaluation Criteria (GEC). From 25 January to 5 February, the Land Portal Foundation will be holding a debate on the Global Land Tool Network’s Gender Evaluation Criteria (GEC), which were created to assess the effectiveness of land tools in supporting women’s land rights. The discussion will focus on sharing best practices and lessons learned for supporting women’s land rights. 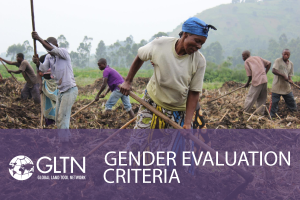 From 25 January to 5 February, the Land Portal Foundation will be holding a debate on the Global Land Tool Network’s Gender Evaluation Criteria (GEC), which were created to assess the effectiveness of land tools in supporting women’s land rights. The discussion will focus on sharing best practices and lessons learned for supporting women’s land rights. These tools have been tested by numerous organizations working to make the lives of women better. Espaço Feminista in Brazil is organizing women across social movements to fight the very origins of gender and racial inequality. The Grassroots Sisterhood Foundation in Ghana supports young girls and women suffering from injustice due to cultural practices and to empower poor women in rural communities. Lumanti in Nepal is dedicated to securing shelter of the urban poor and marginalized people and improving their quality of life. The Uganda Land Alliance promotes people centered land governance that recognizes and protects the rights of the poor and vulnerable through advocacy for fair land laws, policies and empowering rights holders for sustainable livelihoods. These are just a few of the organizations that are using the Gender Evaluation Criteria to make sure their efforts towards achieving women’s land rights are effective. This debate will highlight their experiences in using this tool. Why did you decide to use GEC to promote women’s land rights in your community? Was it successful and why? What challenges did you face in using this tool? What were the positive and negative outcomes? Please share a personal story of your experiences. What other tools have you used to promote women’s land rights? What were the positive and negative outcomes of these tools? Have you combined different tools in the same project or activity? If so please share a story about this experience. If you have used GEC and other tools to promote women’s land rights could you make a comparison between these different tools in terms of replicability, effectiveness, and issues that you can tackle using the different tools and different results and challenges? How can we bring women’s land rights to the next level? What is the role of evaluation tools in doing this? If you have not used the GEC before, based on the experiences shared through this online discussion, do you think your activities would benefit of its use? If so how? Would you be interested in learning more about GEC and other tools to promote WLRs? If you are aware of other effective tools to promote women’s land rights that have not been mentioned in this discussion (and you used them) please share your experience. If you are a stakeholder on land governance issues and care about improving women’s land rights, now is the time to bring your voice to this discussion. The debate will take place on the Land Portal in English, French and Spanish from January 25 to February 5. If you are already registered on the Land Portal, you will need to sign in to post comments. If you do not yet have an account on the Land Portal, please create your account now. Everyone working on land issues can benefit from being part of the Land Portal community! The discussion is being held simultaneously on the Organization for Economic Cooperation and Development’s Wikigender platform.